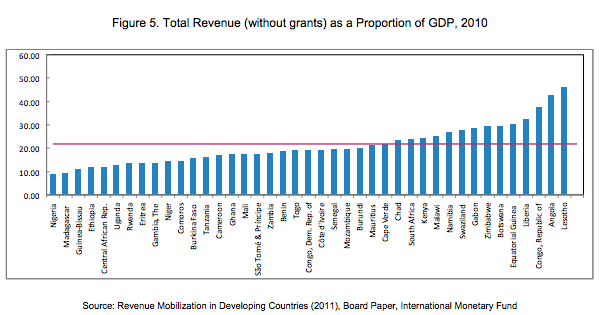 Why do developing countries tax so little? Low-income countries typically collect taxes of between 10 to 20 percent of GDP while the average for high-income countries is more like 40 percent. In order to understand taxation, economic development, and the relationships between them, we need to think about the forces that drive the development process. Poor countries are poor for certain reasons, and these reasons can also help to explain their weakness in raising tax revenue. ……….low taxation may reflect a range of factors that also help to explain why low-taxing countries are poor. From this perspective, the most important challenge is taking steps that encourage development, rather than special measures focused exclusively on improving the tax system. 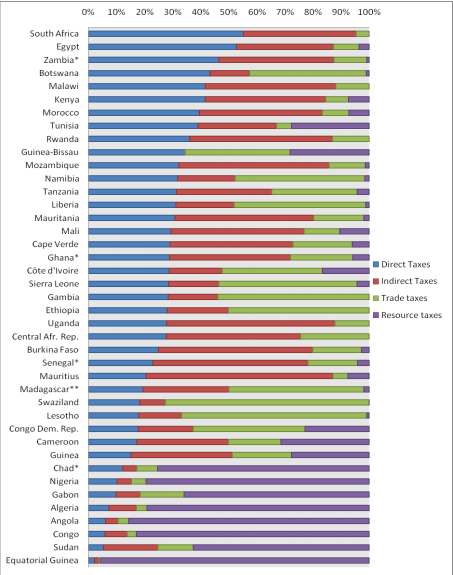 In the specific case of Africa, here is a chart from 2010 (2007) showing the tax mix in African states. We know from theory that the share of direct taxes in the tax mix tends to be a good proxy for state capacity. But the structure of the economy appears to matter, and endogenously determines both the proportion of taxes as a share of output collected (see Figure 1 above) and whether states bother to invest in the capacity to exact direct taxes (see the extreme case of oil rich Equatorial Guinea). Lastly, the tax story in Africa points to a positive increase in state capacity over the last 25 years. Since the early 1990s, the region’s mean tax revenue as a share of GDP has grown from 22% to more than 27%. Per capita tax collection has also been on the rise. That said, there is quite a bit of variance in these measures, with lower income countries doing considerably worse than their richer counterparts. Update: Morten Jerven (author of Poor Numbers) just alerted me of the existence of this cool dataset on taxation and development.